Formulation: Moor extract, horse chestnut and firming horsetail are combined with olive oil then carefully blended using unique rhythmic processing methods to allow the properties of the nurturing plants to be transferred to the oil. I enjoy using the body oil after I wash with the body wash. It's a nice alternative to cologne which I don't use. The smell is gentle and not overwhelming. I really like the lemon-lemongrass combination. I first found the Moor Lavender Calming Body Oil in Whole Foods. Unfortunately, they only had the tester bottle left. I was so disappointed that the sales person allowed me to keep the tester. I'm so thrilled that I was able to purchase a bottle on your website. I LOVE it. Good for dry skin. I used the formula several years ago and feel as if it might have had a greater concentration of oil then. Overall I highly recommend it. My daughter used it and she loved it. Has been a favorite of mine for years, and I highly recommend it. I am really enjoying my Moor Lavender Calming Body Oil. I feel pampered every time I use it. Great product. Rich and fragrant. One of my favorites that I purchase again and again.
. I use these oils after my shower while skin is wet. My skin over my whole body has remained healthy, supple and taut even though I'm past 70. Moor lavender is calming and protective as well. Have been using this on my most driest areas on my legs. Works wonders keeping them moisturized during this cold winter season. The smell is lovely, a true lavender not perfumey. The body oil is moisturizing without a heavy greasy feel. I have very dry skin and this is perfect for my skin. Am a fan of Dr. Hauschka body moisturizers though they are pricey because they work. I got this one on discount. This body oil works with me and seals in hydration long enough during cold days. The glass bottle is a reassurance of quality for me. The title says it all. I was at the Garden Club this morning, and the suppleness of my skin, compared to most of the other members was very obvious. Very fun to have such nice, glowing skin after all these years. Am 80 years old, and getting lots of compliments. I love this oil. I use it before bed. In addition to moisturizing my skin, the smell stays with me all night long! I tried to use this as a body oil and didn't like the way it felt on my skin. I used it in my bath water and it felt really great. It made the bath feel so much better and my skin felt softer afterwards. I have used the Moor Lavender oil to travel, but now in a bustling city I use it almost every day. I highly recommend this luxurious body oil for night or even in the morning before rushing off to work. Horsetail and sea chestnut work to tone after a shower with spritzes of the bath essence (yes, in the shower too). Glides well over wet skin. The lavender oil is so fresh and soothing. I use it on my skin before i go to bed. It has a wonderfully calming effect. 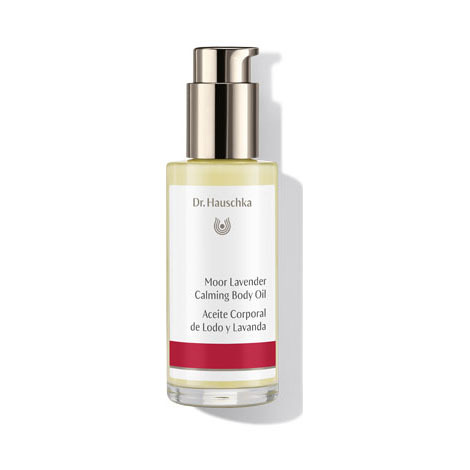 This is the best body oil Dr Hauschka makes. It is very gentle yet effective, almost a lotion texture. The scent is delightful. This oil looks more like a lotion, but definitely feels more like an oil when you put it on. I use it right before I go to bed and the smell is so nice and calming. It makes my skin feel really great, too. I love this "oil" that is more like a very light cream, just to know it comes from all-natural and only the best ingredients I feel safe and comfortable putting it on my body. I ordered all the oils, but wish I had ordered more of this scent! this is like no other lavender oil on the market. It's a creamy oil and the scent is amazing! I love using the lavender oil after an evening shower. It prepares me for a cozy, restful bedtime. I have been using this for years. Very soothing and comforting at night. The scent is the real thing. A little goes a long way. This splendid oil is soothing and strengthening. Ideal for wintry days. Makes my skin fortified and velvety-soft. The scent transports me to a meadow. I enjoy this product for the calming scent and velvety feel on my sensitive skin. Definitely recommend. Relaxing send off to snoozeville! I have this on my bed stand. I love using it right before I turn in for the night. I put a pump full on my hands and arms and the lavender scent lingers on till I get to sleep. Lovely! Must have for winter time, smells divine and leaves skin hydrated. One of my favorite Dr. Hauschka products! This oil has a wonderful lavender smell. I was looking for a high-quality, natural moisturizer, and found it in this body oil. It is a great all-around moisturizer. The consistency is different from a lotion of course, but it absorbs quickly and easily and it feels great. Unlike lotion, you do need to shake it before dispensing. The only drawback is that it has a pump cap that you twist to close. I have to be a little bit more careful when packing it to travel, but I haven't had it leak yet. If you love lavender, then you should definitely give it a chance. Wonderful for dry winter skin in the chilly Northeast. Soothing smell of lavender lasts most of the day. My mom used to put some of this oil on my belly when I was a child to help me go to sleep. It is very relaxing! A little goes a long way. The best scent of all Body oil for relaxing and clam. I love all of Dr. Hauschka's body oils, and believe I have used most of them so far. This Moor Lavender Calming Oil is good, but has a really thick consistency for an oil - not sure what from, it is never clear, always sort of yellow & cloudy. That being said, my body still likes it, and it is calming. My skin feels fed when I use it, and supple. Great. Soothing and lots of hydration. I use this for protecting my skin when swimming. This lavender oil is great. It is a wonderful addition to my relaxation routine before bed. The oil is very smooth and feels soothing for my achy muscles and active brain! Also, the lavender scent is the prefect intensity. I definitely recommend this product to anyone who enjoys the scent of lavender and relaxing body oils. I love this product. Nice consistancy. Great scent. What a wonderful, awesome smelling, soothing product! I first used this in Europe and also on my kids. Everyone in the family now loves it. Small amount for a foot reflexology- perfect! Try it and you will be addicted! I highly recommend this Moor Lavender Body Oil. I use it at night after bathing. I experience a much sounder nights sleep when I use this body oil.